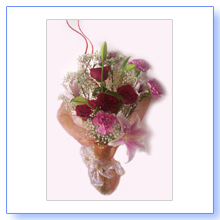 Mixed flowers bouquet in a "leaf vase"
This beatiful carnations and mums bouquet is available all�year long. Flowers are always beatiful and though they may be arranged in a number of ways, all of them are suitable for any occasion. We have special collections for the special events like Valentine's Day or Christmas and we always place link for such an event in the top of this page. Below you can find links to more compositions divided by the type of arrangement: bouquets, baskets, arrangements in container. You can select one of the samples presented, or you can just call or e-mail us and explain your needs. 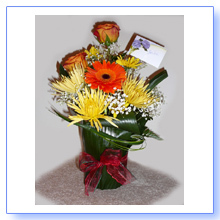 Flower Rainbow is a perfect choice for sending flowers in Barrhaven, Nepean, Kanata and whole Ottawa and surrounding area. 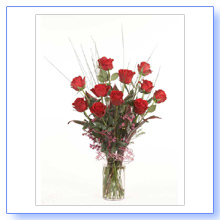 If you are using search engine for finding somebody to send flowers in Ottawa what kind of keywords you usually use? weddind flowers ottawa ? ottawa weddind flower ? ottawa weddind florist ? flowers in ottawa ? ottawa florist ? flower shop ottawa ? flowers ottawa ? ottawa flowers ? Flowers in Nepean ? Nepean florist ? Flowers shop Nepean ? Flowers Nepean ? Nepean flowers ? Flowers in Kanata ? Kanata florist ? Flowers shop Kanata ? Flowers Kanata ? Kanata flowers ? Flowers in Barrhaven ? Barrhaven florist ? Flowers shop Barrhaven ? Flowers Barrhaven ? Barrhaven flowers ? 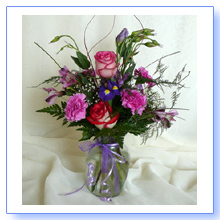 Next time go directly to our website www.flowerainbow.com or call us 1-613-825-7656. 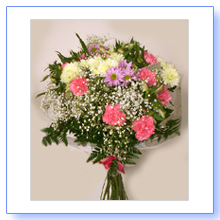 We have wide selection of fresh cut flowers and we work with multiple wholesalers. Use us for flowers delivery in Ottawa. We are available 7 days a week at any time. We do 3 daily runs and we deliver up to Carleton Place, Smith Falls, etc. 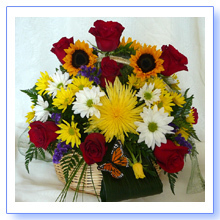 We are independent florist and are NOT an FTD or Teleflora member.